Stroud Green Christian Assembly was founded in the 1920s during the nationwide move of the Holy Spirit which was affecting many traditional churches and many who were not normally church attendees. The Pentecostal Evangelist Smith Wigglesworth who had a remarkable and renowned ministry was apparently involved in the founding of the Assembly in that he held a gospel crusade in Finsbury Park out of which came converts who were introduced to the Pentecostal experience. The Smith family were then members of the Stroud Green Baptist Church but were obliged to leave because their experience of the Holy Spirit and their practice of His gifts were in those days frowned upon by many of the established denominations including the Baptist Church. 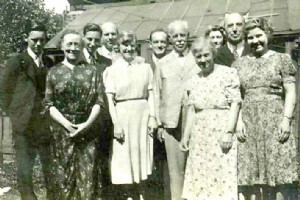 Founding Members: Smith Wigglesworth (5th from right), Elizabeth Smith (4th from right) and John Smith (2nd from right) - Pastor Roger Winter-Smith's grandparents. Swinborn Smith (4th from left), also known as Wilfrid - Roger's Winter-Smith's uncle - John and Elizabeth Smith's son. The other persons were not founding members. Photograph taken at No. 63 Oakfield Road, London N4, circa 1940. They began to hold meetings in various venues including a shop on the corner of Perth Road and Stroud Green Road and an upper room above a garage. The work was initially led by Mr. Wilfrid Swinburne Smith and his brother Mr.Thomas Winter Smith. The congregation joined the Assemblies of God, then an embryonic pentecostal movement, and this association has continued to the present time but is now coming to an end. In 1936 Mr.Swinburne Smith founded the Assemblies of God church in Ponders End which continues to the present time. He served there as pastor for many years and was pastor emeritus when he died in 1999. On the opening of Ponders End in 1936 Mr. Thomas Winter Smith became formally the pastor of Stroud Green where he served until his untimely death of heart failure in May of 1975. He was therefore in office for almost 40 years. The present pastor is his eldest son, Mr. Roger Winter Smith, who served since 1991. The Assembly strives, by God's Grace, to preserve traditional pentecostalism of a stable and scriptural kind and to seek God for His special favour and presence. In this connection the means of grace are sought to be applied particularly Bible exposition sound in doctrine, prayer and loving fellowship. The present building was acquired in 1955 and at the inaugural service one of the lecturers from the Assemblies of God Bible College, Mr.Elisha Thompson, ministered. His text was Psalm 132:13-14 "For the Lord hath chosen Zion, He hath desired it for His habitation. This is my rest forever: here will I dwell; for I have desired it". It is the perpetual desire of Stroud Green Christian Assembly that God's intention then expressed should be fully realised and that we should be an expression of His will in the Stroud Green area and beyond where we have been called to serve. Mark Mullins joined the Assembly in 1994 following his disillusionment with the Toronto blessing which had been embraced by the charismatic Anglican church he was then attending and which he felt led to leave. Mark became an elder in 2002. Philip Bray joined the Assembly in 1995 after finding the Lord during his gap year in the Far East. He became an elder in 2007. A recording of a traditional pentecostal gospel service recorded for Songs of Praise for the BBC in 1967 at Rotherham. Speaker: David Powell, meeting led by Douglas Quy.